Being trapped in a contract without feeling that proper consent was given to the service provider is the frustration that tops the list of Canadian business complaints about service providers, according to data from the Commissioner for Complaints for Telecommunication Services (CCTS). Contract dispute was the primary reason that small businesses felt they needed to file a complaint with the body that offers to help resolve complaints between Canadians and their service provider for wireless, landline, or Internet. While Canadian consumers are most likely to complain about billing errors, businesses were most likely to complain about their contracts with providers. The CCTS provided the data exclusively to ITBusiness.ca, after the request was made following the main report about overall complaints was released earlier this month. About 47 per cent of business complaints were about a contract dispute, and 29 per cent were about billing errors. Consumers reversed that order, complaining about billing errors 45 per cent of the time and contract disputes 29 per cent of the time. Often the contract disputes boil down to an auto-renewal feature that was somehow not communicated, he adds. Complaints about automatic renewal of contracts made up 15 per cent of all business complaints. Add that to the number of businesses that complained about early termination fees – usually incurred right after a contract was canceled in anger after an automatic renewal – and issues around contractual consent rise up to 25 per cent. The burden of understanding a contract and making the terms clear lies on the shoulders of both parties, Maker says. Businesses must understand their terms and obligations, and service providers must make efforts to issue notices. “The should put it up on the marquee in flashing lights when that auto-renewal date approaches,” he says. While complaints fielded by the CCTS on the consumer side are mostly about wireless service (more than 60 per cent), businesses complain about wireless and landline almost evenly. 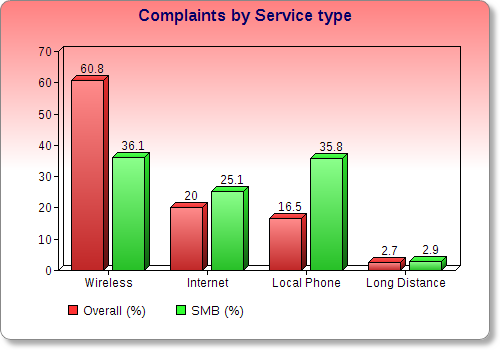 Just over 36 per cent of business complaints were about wireless service, and just under 36 per cent were about local phone service. About one-quarter of complaints were about Internet services and the remaining three per cent were about long distance phone services. Business complaints are more evenly distributed than consumer complaints because the are more likely to package all their services together with one provider, Maker explains. “So when they have a problem with their providers, they may feel it through all their services,” he says. 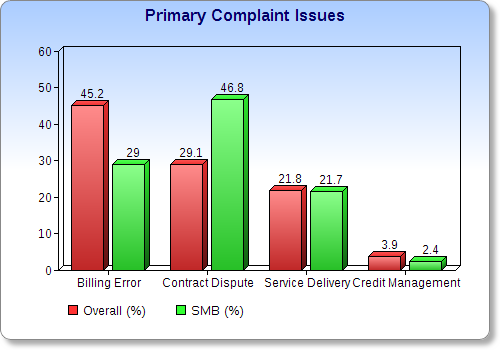 Overall, business complaints just make up a small portion of the complaints received by the CCTS. 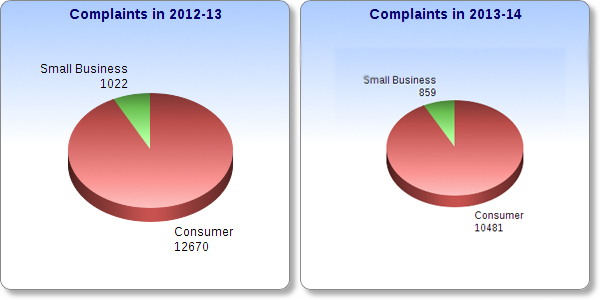 For the 2013-2014 period, it received 859 complaints from small businesses out of 11,340 complaints in total. That’s down about 19 per cent from last year, when 1,022 complaints were made by businesses. But Maker says the CCTS is available to businesses just as equally as it is to consumers to help resolve issues when needed. After all, at their root most complaints come down to the same basic issue, the commissioner says. A lack of communication.